Cards will be issued to any resident of New York State who can provide two forms of identification, one of which includes your current address. Valid forms of identification include a driver’s license or a state issued non-drivers ID with your current address, an ID card or badge with your name typed (NOT written) on it, mail with your name and current address printed on it and a postmark within the past 30 days. If you do not have these forms of ID please check at the Check Out desk to see what else you can use. If necessary a postcard can be sent to your address for verification. There is a maximum late fine of $5.00 per item or $20.00 for multiple items returned at the same time (excluding museum passes). Must be 18 years of age or accompanied by Parent or Legal Guardian to check out movies; unless Parent or Legal Guardian signs permission slip. You can use the book drops at the Main library and both branches to return books, audio and video cassettes, and CD’s when the library is closed. A child is defined as any one under 18 years of age. If you wish to obtain a card for your children they do not need their own identification; you may use your ID to get them cards. (Two forms of ID required, one with your current address.) You must sign the registration card for them. Children over 12 years of age who have their own forms of required identification may get a library card themselves. You do not need to sign the registration card . Children under 7 years of age must not be left unattended at any time, including when participating in programs. If you wish for your children to avoid specific titles, library collections or topics, you must arrange that with your children. Library staff can assist in making recommendations or finding requested items but will not censor. Access to the internet and videos requires a parent’s permission in person. You accept responsibility for selection of videos as well as use of the internet. Please familiarize yourself with our videos and internet policy before granting this permission. 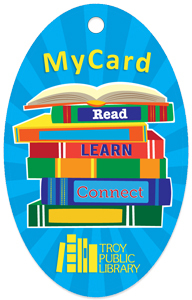 We are excited to announce the Troy Public Library MyCard. Our new youth card improves access to library materials for children who live in the city of Troy. The MyCard is for kids and teens ages 5-17 who live in the city of Troy. With a MyCard, kids can take up to 3 items out at once. They will be able to borrow books, audiobooks, and music CDs without any late fines. Only charges for lost or damaged items will apply. 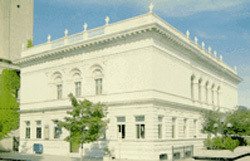 The MyCard is only valid at Troy Public Library locations. If a child already has a card in our system they may keep it or replace it with our new MyCard. Be sure to check our website or our Facebook page for details and updates. The loan period for a DVD is 7 days. A fine of $0.10 per day per title will be applied to movies returned late. There will be a maximum fine of $5.00 per item. You will be required to pay for lost or damaged items. Most items can be returned in the book drop. New Release DVDs cannot be requested and are not renewable. Renewals may be possible on other titles. You can attempt to renew in person, on the telephone, or online. You’ll need to have your library card available when attempting to renew. A child with a MyCard is not able to borrow movies. With a regular borrowers card; a child under the age of 18 may not check out movies unless a parent or legal guardian is present or has completed this video permission form. Parents/guardians are, ultimately, responsible for the materials their children check out. Please note the computers shut down exactly 30 minutes before the library closes. Main Library: We now have the use of the Rensselaer County Courthouse parking (see map) lot in the evenings after 5:00 pm and on Saturdays, Sundays and holidays. Parking is accessible from the alley on Congress Street, across from Brueggers, with an exit onto Third Street. A caution however. The county is not responsible for theft or damage to vehicles or contents of vehicles parked in the courthouse lot.Since the library does not have a parking lot, during the day, on street parking is the only option. It is important to remember that parking on the street north of Ferry Street (now a tunnel on second street) is designated as downtown and two hour parking is in effect. South of Ferry street there is no time limit and all day parking can usually be found within two blocks of the Main Library. Congress Street is designated as a pay to park area.Friday is alternate side of the street parking on Second and Third Streets for regular street cleaning and/or snow plowing. No parking on the West side of the street between 9AM and Noon and no parking on the East side between Noon and 3 PM. Parking restrictions are strictly enforced. Lansingburgh Branch: The Lansingburgh Branch on 114th Street has a small off street parking lot. If the lot is full, on street parking is readily available.